CHARACTERISTICS - An ideal companion. Highly adaptable in domestic and sporting surroundings. TEMPERAMENT - Gentle, affectionate, even disposition. HEAD AND SKULL - Long and lean, flat on top tapering to muzzle with slight stop, rather wide between the eyes, jaws powerful and clean cut, nose black, in blues a bluish colour permitted, in livers a nose of the same colour, in whites or parti-colour a butterfly nose permissible. EYES - Oval, bright, expression very alert. EARS - Rose shaped, small, fine in texture. MOUTH - Jaws strong with a perfect, regular and complete scissor bite, i.e. the upper teeth closely overlapping the lower teeth and set square to the jaws. NECK - Long, muscular, elegantly arched. FOREQUARTERS - Shoulders oblique and muscular, blades carried up to top of spine, where they are clearly defined. Forelegs straight and upright, front not too wide, pasterns strong with slight spring, elbows set well under body. BODY - Chest very deep with plenty of heart room, brisket deep, well defined, broad back, firm, somewhat long, showing definite arch over loin but not humped. Loin giving impression of strength and power, ribs well sprung, muscled on back. 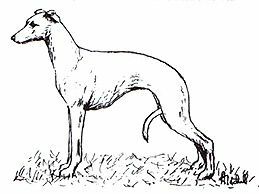 HINDQUARTERS - Strong, broad across thighs, stifles well bent, hocks well let down, well developed second thighs, dog able to stand over a lot of ground and show great driving power. FEET - Very neat, well split up between toes, knuckles well arched, pads thick and strong. TAIL - No feathering. Long, tapering, when in action carried in a delicate curve upward but not over back. GAIT/MOVEMENT - Free, hindlegs coming well under body for propulsion. Forelegs thrown well forward low over the ground, true coming and going. General movement not to look stilted, high stepping, short or mincing. COAT - Fine, short, close in texture. COLOUR - Any colour or mixture of colours. FAULTS - Any departure from the foregoing points should be considered a fault and the seriousness with which the fault should be regarded should be in exact proportion lto its degree.